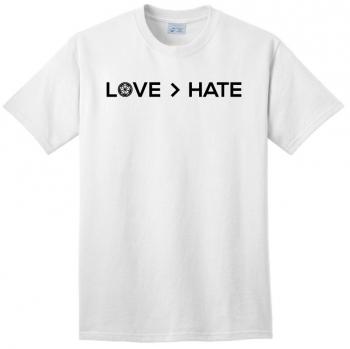 Love>Hate I saw that message on Instagram on a t-shirt from an ELCA church in Fort Myers FL. They were selling them to their members to wear to a vigil later in the week. I liked it because of the playful use of math but I gave thanks for it because of its simple and profound message. I also found where I could buy it (Old Lutheran website) so I have one on the way. I am late writing this reflection because I was trying to get my head around what I to say after the shooting in Orlando. But then I saw the t-shirt and saw the texts through the lens of the t-shirt and realized…yup, theses texts assure us that Love is greater than hate. The Isaiah text describes how God is in grief, feeling scorned and rejected by the people. He had his arms wide open to them and they ignored him. He names the consequences of their actions but then promises that Love is greater than anger, that Mercy is greater than judgment. In this part of the psalm we hear the psalmist cry for help but we also hear that the psalmist trusts that God will deliver; the psalmist trusts that Love is greater than suffering. And then the psalmist gives thanks for that. St. Paul in Galatians proclaims that the hate that divides humankind is no more because of Christ Jesus, God’s Love incarnate. The walls that stood between us are no more so there are no Jew nor Greek, slave nor free, male and female for all are one in Christ. Christ is greater than all that divides us. Finally, in the text from Luke, Jesus steps into the life of a man who has been suffering under the bonds of demonic Hate for years. Those bonds were stronger than anything – even chains and shackles – that his community had used as they kept him prisoner, attempting to rein in the influence of that monumental Hate dwelling in him. But still he was tortured by the demons; he lived among the dead. As Jesus approached, the demons immediately recognized him. In the Good News translation of this text, when Jesus asked the demons their name, the answer they gave was “Mob”. Note: NRSV uses “Legion” and if you know that meant during the New Testament days at least 5000 Roman military guys, that is a great metaphor. But I think Mob is a great image for this day and time.. It was even worse for the pigs than for the man. into the lake and drowned. People went out to see what had happened. They came to Jesus and found the man from whom the demons had been sent, sitting there at Jesus’ feet, wearing decent clothes and making sense. It was a holy moment, and for a short time they were more reverent than curious. I love how they put that - Witnessing Love > Hate is a holy moment…. a holy realization. Like the psalmist, we pause to say thanks. I am sure that some of those who are deeply grieving their losses in Orlando cannot this moment believe that Love > Hate. I am sure that for some it feels like love is down for the count and hate is the victor. So I invite you, dear reader, to hold them gently in your prayers and believe for them right now. We can trust the promise of these texts for them. With time, and the outpouring of love and support from all over the country/world, they may be able to believe again. The texts are so fitting for this moment. The Psalm's second line, "Deliver my soul from the sword" helps with all the pent up frustration. Love is greater than hate and that compassion is what is most needed.